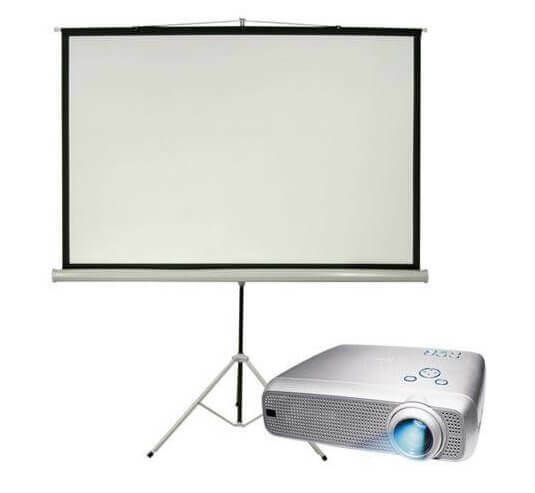 We can supply all you need for a projector hire in London & Surrey. We can supply projectors & AV equipment to all sorts of events including small to large meetings, conferences, exhibitions, race nights, film shows (DVD and video), weddings, and parties. Our projectors can be dry hired or hired with a technician who will set up everything and work with you throughout the event. We can also give advice on how it all works so next time you can do it yourself if you wish! We will never leave you by yourself. All our projector hires are bespoke due to a few factors which we need to take into account such as brightness, aspect ratio, long throw or short throw, front or rear projection. So please drop us a message first and we can send you your quote. We can also supply your sound system and any event lighting you require. A projector can look fantastic at a wedding or either side of the stage during a performance!